Ditch the frozen fries for a fresher and healthier option. Who doesn't love French Fries? Why not ditch the frozen bag version that can be full of unnatural ingredients and opt for field fresh potatoes that crisp up nicely in your oven? Cut potatoes into similar sized pieces. Place fries in a ziplock bag with olive oil and toss to coat. Spread fries in a single layer on a cookie sheet covered with parchment paper. 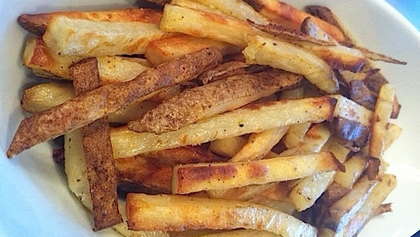 Sprinkle fries with season-all salt and bake for approximately 35-40 minutes until crispy on the outside. Flip fries halfway through cooking time to brown evenly on both sides.